The main task of an American Hockey League (AHL) team is to develop players for their affiliated National Hockey League (NHL) team. The Syracuse Crunch last year had many players who were on the cusp of jumping to the Tampa Bay Lightning. This season, those players make up a third of the Lightning’s roster. Last Saturday, thanks to the public relations offices of the Crunch and Lightning, I got to photograph my first NHL game in the Tampa Bay Times Forum. The Lightning’s photographer, Scott Audette, made me feel right at home and assigned me to one of the coveted photography holes along the glass at ice level. 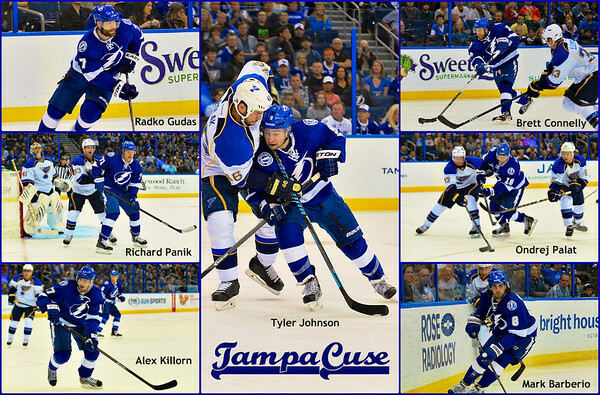 Former Syracuse Crunch players now on the Tampa Bay Lightning roster who played against the St. Louis Blues on Saturday, November 2, 2013. The Lightning won 4-2 thanks to a few of these players. The Lightning defeated the St. Louis Blues, 4-2, thanks to former Syracuse Crunch players Alex Killorn (1 Goal, 2 Assists), Brett Connelly (1 Goal), Radko Gudas (1 Assist) and Mark Barberio (1 Assist). The Top Gun line of Tyler Johnson, Ondrej Palat and Richard Panik were also factors in the win. The term TampaCuse was coined by the producer of the RAW Charge website which is all about the Tampa Bay Lightning and its farm system. TampaCuse links the Tampa Bay Lightning with their Syracuse Crunch farm team and shows the strong connection between the organizations and their fans. It quickly became a popular hashtag with fans of both teams. I even bought a TampaCuse t-shirt from their online store. This entry was posted in Sports, Weekly View and tagged 70-200mm, crunch, florida, game, ice hockey, lightning, national hockey league, nhl, nikon D700, nikon D7100, professional, syracuse, tampa bay, tampa bay times forum, vr. Bookmark the permalink. I dig the TampaCuse slogan. NIce shots. Good use of the coveted photo hole in the plexiglass. Thank you, Mark! I wish the War Memorial had more photo holes. The one I use is small and too high up on the glass. Someday! Those are some awesome pictures! Hope you get the chance to come back to the Forum more often to watch “TampaCuse”! Our boys are amazing!! So do I, Victoria. I want to see how these guys grow at the NHL level. Tampa Bay fostered them the right way and it will pay dividends for years to come.